Passionatemae | Food has a way of bringing people together: Four Friends + A Giveaway! 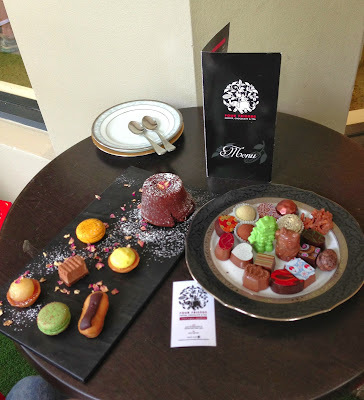 Last month, my husband and I were invited to taste some chocolate treats at Four Friends Café. How cute is that macaron's board! At a closer look, we noticed that they claimed that their chocolates are all handmade, were all organic and did not contain any artificial colours or flavours! That made us even more curious and excited to try them. Surprisingly, we've not heard of this place before even though we often go to the area in Crows Nest. The day we were there, there was a birthday celebration, and it was packed! So we took our time to check out the store and look at the goodies she had on display! There were so many truffles to choose from! So after choosing our drinks, we chose our drinks - we went with Mocha (Pablo & Rusty), Hot chocolate (shaved chocolate with hot milk) and a tea (sorry, I can't remember what I ordered), we went upstairs to wait on the cosy sofas while they prepared our orders. Katze, came up and brought us these! Seriously, so many truffles, delicious! I ate more than I usually would. My favourite truffle has got to be the Caramelised Almond Clusters. It is different to the ones I've eaten before, it has the right amount of caramelisation to it. How cute is the Robot! Then she came with more! The chocolate cake...omg! the chocolate ganache in the middle was just so smooth, it wasn't grainy at all! Those little tarts, lemon and pear flavours, was really good, the fragrance from the pear, has the right balance of sweetness. Katze Ting, the owner was there to show us around. She shared with us her story on how Four Friends started. The whole experience was just great, Katze's passion to deliver great food, just shows in her food. You can feel the love that has been put into it. You can read more about her and her café here. Thank you again for sharing your delicious treats with us, Katze! As we had such a great experience, we would like to share the love by giving 2 lucky readers a chance to dine at Four Friends Café courtesy of Four Friends. Each winner can bring a friend to share this experience with. Each winner will get a dessert plate for 2 people worth $40. This dining experience is valid until the 31st Jan 2014. To get a chance to dine at Four Friends Café, please leave a comment below, telling me what would you indulge in during this holiday season and follow me on my Instagram - Passionatemae & Facebook page - Passionatemae if you have not. Giveaway closes on the 20th December 2013 11.59pm (Sydney time). Winners will be announced the next day. If you're the lucky winner, please email me your details, more info will be up when the announcement goes out. Giveaway is now CLOSED! Thank you for taking part in this giveaway. Awww the robot chocolate is so cute! Definitely a fine artform to making chocolate - impressive that they don't use artificial oolours or flavours! Oh my, this looks amazing, was looking for a good tea spot near to work and your blog popped up! This festive season I'm going to indulge in catching up on my pile of books, fuelled by tea and cake, and aided by turning off internet access!